Call (252) 247-4003 to register your troop for Special Activities and Badge Programs designed specifically with Scouts in mind. Join Aquarium instructors on an adventure that fosters creative exploration, scientific theory and feet-wet fun! 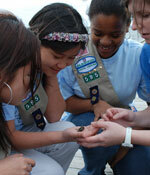 In this program, Scouts learn what it means to be a naturalist. They learn the difference between the terms venomous and poisonous. They learn about flyways, explore the salt marsh and learn about a variety of poisonous plants. They see live animals in a classroom presentation and in our exhibits, and also get hands-on experience using seine and dip nets. Your group must be paid in full 2 weeks before your scheduled event. Payment will be used to determine staffing needs. Additional people may be added to your reservation after this point but no refunds will be granted. This program covers the basics of oceanography. The instructor talks briefly about marine careers and educational backgrounds. 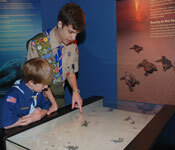 Then the scouts reenact many marine occupational opportunities in the classroom, in our exhibits and behind the scenes. Finally, you learn about Water Wonders.This hands-on program combines laboratory activities with field explorations. Lab activities include water quality testing (pH and salinity) and microscopic studies of live fresh or saltwater animals. Field activities include a guided tour of the Roosevelt Natural Area, where participants explore salt marsh plant communities and sample the waters for marsh inhabitants. In this program scouts will learn the importance and plants and animals in the environment as well as some species that are protected. They will also learn about both marine and land food chains. Take a nature hike through the different environments of a barrier island and possible identify species of birds, mammals, reptiles, amphibians, mollusks/crustaceans, and fish. Arrival and Orientation	15 minutes We would like to take a moment to introduce your group to the staff that will be conducting your program and to review the agenda. Animal and Plant Talk	45 minutes Learn about the importance or plants and animals to each other and the overall ecosystem in which they live. Meet an animal that is protected in our state and learn what we can do to help. Food Chain Activity	30 minutes Learn about food chains and create an example for both land and marine habitats. Participate in activity that shows the importance of the food chain and how one change can break it down. Nature Hike/Track Casting	45 minutes Take a nature hike on one of the nature trails at the aquarium and look for animal clues such as tracks. If tracks are found a plaster cast will be made; if not alternative plans for a cast will be provided. Talk about the different habitats found on a barrier island. Beach/Marsh Service Project	45 minutes Participate in a beach or marsh clean-up. Shell collection can also be done during this time. **Note: The aquarium cannot provide transportation to the beach access. Transportation must be provided by the scout group** *Program start times can be adjusted to fit your group’s needs. The Aquarium does not issue a badge for this program; however most requirements for the patch will be met during this program. 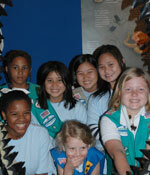 In this program scouts will learn the characteristics of and differences between amphibians and reptiles. They will learn about the life cycles of both groups and meet a few reptiles and amphibians through a live animal presentation. Scouts will learn about protected species as well as why amphibians and reptiles are important in our environment. We will visit our venomous snake house and also discuss some of the superstitions that surround reptiles and amphibians. Arrival and Orientation	15 minutes We would like to take a moment to introduce your group to the staff that will be conducting your program and to review the agenda. Animal Presentation	1 hour Learn about the characteristics of reptiles and amphibians and their habitats and habits through this live animal presentation. Life Cycle Activity	30 minutes Participants will learn about the life cycle of an amphibians and reptile and discuss the differences between the two types of animals. Venomous Animal Talk	45 minutes Learn how to identify venomous animals and discuss what venomous animals we have here in the state of NC. Visit our venomous snake house to see some examples. Talk about the superstitions that surround reptiles and amphibians. Protected Species Talk	30 minutes Learn about the species protected in the state and why they are protected. Learn simple conservation things that can be done to help protect threatened species. *Program start times can be adjusted to fit your group’s needs. The Aquarium does not issue a badge for this program; however most requirements for the patch will be met during this program. Scouts who complete the day of programs will have completed the requirements for a Water Wonders patch. The program begins with a self-guided tour through the Aquarium. Scouts explore a maritime forest, salt marsh and open beach habitats with an Aquarium Instructor, who explains how the type of vegetation and animals found in each area depends on whether the water supply is fresh and saltwater. Scouts pull a seine net to sample some of the life found in the marsh pools, and pull a plankton net to discover some of the smallest members of the marsh and ocean food webs. These samples are used later to test for pH and salinity, and the plankton is observed under a microscope. While out in the marsh, scouts try their hand at crabbing where they learn about the blue crab’s life cycle and anatomy, and harvesting regulations. Finally, the Instructor sits back and allows the students to become teachers. Scouts are given poster boards, markers and crayons to create a water cycle masterpiece that they will present to the group. 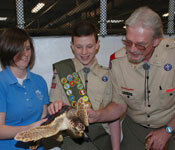 Scouts who complete the day of programs will have met the requirements for the Sea Turtle patch. 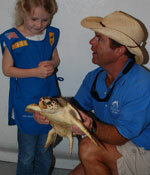 Scout activites will include helping with the sea turtles, making a poster that shows body parts of a sea turtle. Make a book or scrapbook about sea turtles. Create a brochure about sea turtles and how they live. Create a preformance about sea turtles and preform for another group. Help clean up our local beaches. Trek the maritime forest, the salt marsh, and the shallow waters of Bogue Sound to learn about the fascinating creatures that live in these vital habitats. Learn to catch the big ones from the surf or from the pier. Participants are instructed in the basics and then get hands-on experience, with all equipment and bait provided. Ages 10 and up. Prices range from $15- $25.